What's New with APIs in Autodesk Design Review 2011? Design Review Software Engineer, Herbert He, mentions a few noteworthy changes to the 2011 Design Review APIs that aren't included in the current API documentation. This new API enables you to detect if the 3D section as an animation section. This would be useful if the client code needs to control whether the animation commands are shown, or to provide some other feedback to the user based on the presence of animation. Query whether the 3D section has animation. If the 3D section has animation object, the value of the property is VARIANT_TRUE, else the value is VARIANT_FALSE. Two lighting commands were added in order to provide a more simplified lighting interface to the user (others were removed from the UI but are still available in the API). These new simplified lighting commands are available in the API. An additional possible value for EModelSectionType2.LightingOption, "No Light". An additional possible value for EModelSectionType2.LightingOption, "Default Light". Two field of view commands were added to allow the user to increase or decrease the field of view. As a result of refactoring the Autodesk Design Review code base, all COM objects were removed from the EPlotRenderer module, relocating all EPlotRender APIs to the EPlotViewer module. Thanks for the update Herbert! Embedding DWF Files: Do You Need New a CAB? When embedding DWF files in a webpage, part of the embed code checks to see if the person viewing the webpage has Design Review installed on the computer. If not, the embed code automatically downloads and installs Design Review using a CAB file. If you use this functionality, you may have noticed that the auto-installed CAB file hasn’t been updated recently. The embed code installs Design Review 2009, instead of the most recent version, Design Review 2011. 1. How many of your customers are affected by this issue? 2. What revenue impact has this issue had to your company? 3. How important is an updated CAB file to your application? As always, we appreciate your input! "DWFxConverter application is a tool to convert a source DWF file to a DWFx file. This application needs to be run from the command prompt. outfile:Specifies the directory and/or filename for the file being generated. If no path and only a file name is provided, the file is generated in the folder from which the command is executed. In the command prompt, from the folder containing the application, type DWFxConverter.exe without parameters to display the usage for this application." Download the DWFxConverter & enjoy! Spotlight on .Net instead of ActiveX ? Historically, AutoCAD has been using .NET for a couple releases now but Autodesk Design Review was never allowed to use .NET until today. In terms of education, any ActiveX control can be used in .NET. 1. Open up a .NET Form application. 2. Make sure the Toolbox is visible. If not, use the “View” menu and select “Toolbox”. 3. Right click in the “Components” bar in the Toolbox and select “Choose Items…”. 4. Select the “COM Components” tab. 5. Check the “Autodesk DWF Viewer Control” item. 6. Push the “Ok” button. Once completed, our framework ADV (Autodesk DWF Viewer) control will show up as a new tool (.NET Form control) in the Components section of the Toolbox and as such, you can drop one right into your application just as you can with any other item in the Toolbox. Also note that this .NET Form control will expose .NET versions of all the same properties, methods and events as its ActiveX counterpart. Note: This *trick* works for any ActiveX control … we’re not special. When doing this, .NET automatically creates what is called an “interop” module (also called a managed wrapper) that does the translation between the COM world and .Net world. However this interop is another module that must be included with any application built using this technique (it will show up in your solutions binary directory and will be prefixed by “AxInterop.”). The newest version of the DWF™ Toolkit 7.5 provides APIs for reading and writing DWF files, the new Microsoft XML Paper Specification (XPS) compatible DWFx files. This is the first toolkit to support DWFx which many of you application developers have asked for. The toolkit includes cross-platform support (Windows, Linux) and 32-bit and 64-bit environment support. In addition to the prebuilt binaries, also provided is the C++ source code. This allows you to compile the toolkit for any platform of your choice. This version of the toolkit handles DWF files generated by AutoCAD 2009 and other Autodesk design software applications. This is the exact same code we use in our own applications. Please find enclosed the API documentation for Autodesk Design Review 2009 which is not included in the product install itself. I have enclosed the documentation as CHM as well as PDF file. Please ensure to save the CHM file to your local disk, else you might experience viewing difficulties - this is a known Microsoft issue, whereas network based CHM files cannot be viewed correctly. The PDF file is really a shortcut for those who prefer to view it outside of the "Microsoft Help UI". Please note that we managed to convert all the content correctly, yet you might find some incorrect numbering of the chapters. The actual API content is correct. I am pleased to say that we are finally making some progress on the API front and our development team has agreed to look at our current API and kick off an overhaul of sort. Needless to say that this is long overdue and I am very excited that this is finally taking shape. Well, "good things take time"! This change will be reflected in next years release and will not affect Autodesk Design Review 2009. The numerous new features and improvements did not leave any room for the much needed API work in the 2009 release time frame. It is planned that the makeover will include not only the addition of missing functionality and correction of problems, but also the removal of API that are not being used or are no longer relevant, due to being linked only to legacy products. This is were YOU come in! Enclosed is a list of API that are currently slated for the "grinder" and it is crucial that you let us know if you are using any of the stated API. The selection was made based on earlier customer feedback and an internal evaluation. Please reply to this post or send your feedback directly to [email protected]. Feedback can consist of anything API - even API you would like to see or is not working for you at this point. Please ensure to include an explanation or supporting documentation with your feedback, thank you. The DWF Toolkit makes application development possible for Autodesk partners. Autodesk is a Microsoft technology partner. The Microsoft Windows Presentation Foundation provides a foundation for building applications and high fidelity experiences in Microsoft Windows Vista, blending together application UI, documents, and media content, while exploiting the full power of your computer. 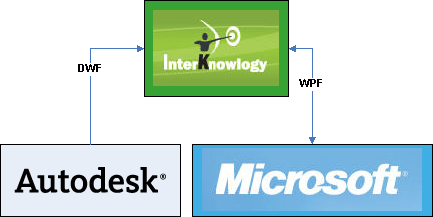 InterKnowlogy is also a Microsoft technology partner. Leveraging the technology of the Windows Presentation Foundation (WPF), InterKnowlogy built a 3D Collaborator for AutoCAD© Drawings. It allows you to annotate on the 2D or 3D surface of AutoCAD Drawings that have been published as DWF. 3D Collaborator is another example of an independent use of the free Autodesk DWF Toolkit. Although the download includes some prewired sample DWF files, InterKnowlogy updated 3D Collaborator this month to make opening your own DWF files easier. Please take 3D Collaborator for a spin with your own DWF files and tell us what you think. In this age of ever expanding bandwidth, does size matter? How is the speed? How would you like to see the metadata presented? You can email [email protected] with your thoughts or simply post a comment on this blog page. Your comments are welcome.